There are numerous pasta products available, consisting of dried and fresh pasta. Some products are available both in a dried and fresh form but there are many more dried products than fresh. The products range in size from tiny soup pasta to large sheets of lasagne noodles. Many of the varieties of pasta are available in flavors, such as spinach, tomato, beets, saffron and squid ink. The flavors also add color to the pasta. Listed below are some of the many pasta products that are available. The cooking times shown below are only estimates due to the fact that the thickness, cooking methods and the brand of pasta can all affect the length of time it takes to cook the pasta to its proper doneness. Pasta should be cooked to its "al dente" state, which is tender but still having a slightly firm bite. Shaped pasta is available in many different sizes and specific shapes. Shaped pasta is generally found dried. The smaller sizes work well with a simple sauce but most shaped pastas can be paired with a chunkier sauce because they are sturdy enough to hold up with the other ingredients. 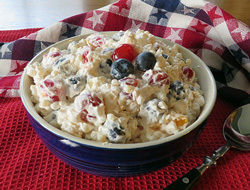 They are also used in pasta salads and casseroles. A pasta whose shape resembles a bumble bee. It is approximately 1 1/2 inches long and has a unique shape that is produced so the open body or oval of the pasta can be used to "catch" and retain sauces spread over the pasta.. Cook for 12 to 14 minutes. Pasta in the shape of a small cone with a ruffled edge. Also known as gigli. Cook for 7 to 10 minutes. Short lengths of pasta that have been rolled across its width, with each side rolled in the opposite direction. The rolled length is then slightly twisted. This pasta is in the shape of a "S" when viewed from the end. It is similar to strozzapreti and umbricelli only longer in length. Casarecci is approximately 2 inches long. Also known as cesariccia and casarecce. A ridged shell pasta that has been rolled to form a long oval shape. It was orginally named Paguri after a tiny crab whose shape it resembles, which is found along the coast of Italy. It was then renamed Castellane, meaning "castle dwellers." This renaming was said to have been inspired by the women at court, who draped their plentiful skirts over their left arms. Cook for 10 to 13 minutes. A small shell shaped pasta that has a rolled in edge. 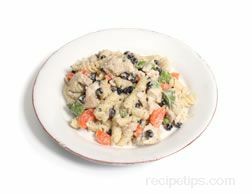 The name cavatelli is sometimes found associated with pasta that is similar to casarecci pasta. The pasta is similar in shape but slightly shorter in length than caserecci. 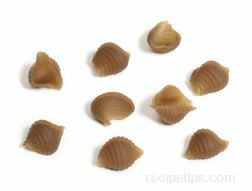 Although the name cavetelli is sometimes associated to the casarecci shaped pasta, it is most often found as the small shell shaped pasta. Cook for 13 to 16 minutes. Translated as "little rag" this pasta is oval shaped with a slight upward curl in the form of a small boat hull. Traditionally made with a rustic and rough texture, the ribs on this pasta work well to hold a variety of hearty pasta sauces. Cencioni has a chewy consistency for main dishes or salads. Cook for 12 to 16 minutes. Medium sized pasta shaped similar to a conch shell. It has a ridged surface and is available in several sizes. Cook for 10 to 12 minutes. The largest of the conch shell shaped pastas. It is often prepared by stuffing the pasta after it is boiled and then baking it in the oven. Cooking Time: Cook for 11 to 14 minutes. A short, curved tubular pasta with a ruffle along the length of the outside curve. Cook for 9 to 11 minutes. A thin, disc shaped, Ligurian pasta that has been hand stamped with the family arms on one side and different designs, such as palm trees, sunsets, and sailboats on the other side. The disks are approximately 1 3/4 inches in width. Cook for 15 to 17 minutes. Bow tie or butterfly shaped pasta, available in several sizes. Cook for 8 to 10 minutes. 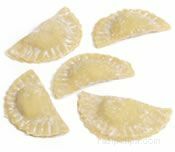 Farfalle rotonde Bow tie shape pasta similar to farfalle except its ends are rounded. Cook for 8 to 10 minutes. A larger version of farfalle pasta. Cook for 10 to 12 minutes. A pasta similar to rotelle and route except that its more flower shaped than round like a wheel. Cook for 8 to 10 minutes. A short ribbon of pasta twisted into a shape resembling a screw or spring-like, corkscrew. Cook for 10 to 12 minutes. 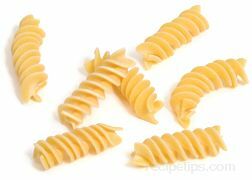 A variety of fusilli that has a spring-like shape that has been formed from a strand that is hollow through the center, similar to bucatini. Cook for 11 to 14 minutes. A low carbohydrate pasta that is the same shape as regular fusilli pasta. It has about 25% of the carbohydrates contained in regular pasta. Cook for 7 to 10 minutes. A large version of fusilli. Its corkscrew shape and rough texture allows it to hold both creamy and chunky sauces very well. When cooked this pasta is very large, swelling two to three times its original size. Cook for 13 to 15 minutes. Pasta that consists of two short pasta strands that are twisted together into a spiral shape. Cook for 8 to 10 minutes. A piece of pasta with a fluted edge that has been rolled into a cone shaped flower. Also known as campanelle. Cook for 7 to 10 minutes. A small version of the dried variety of "gnocchi." Cook for 6 to 8 minutes. The name given to a small potato dumpling that is made with potatoes, flour and egg, or semolina flour and egg. They can also be made with other ingredients added for flavor, such as spinach, ricotta, Parmesan, and yams. They are sold as a fresh and dried product. Fresh gnocchi is found in a variety of shapes, such as ovals, shells, cylinders and flattened disks. Dried gnocchi is generally shaped like a hollowed shell, similar to the shape of cavatelli pasta, but with a ridged surface. Fresh gnocchi generally contains potatoes and the dried gnocchi contains semolina flour and no potatoes. Fresh: Cook for 2 to 4 minutes, remove when the gnocchi rises to the surface. Dried: Cook for 8 to 12 minutes. A thin, short, curled strand of pasta with a small hole running through the center. Its shape resembles a half circle with one end curled in. Cook for 6 to 9 minutes. A hollowed out pasta, which is shaped similar to the shell of a snail, with one end open and the other end compressed, almost closing it completely. Cook for 11 to 13 minutes. A larger variety of lumache, which is generally prepared by stuffing the pasta after it is boiled, and then baking it in the oven. Malloreddus (gnocchetti sardi) A Sardinian-style pasta that is shaped similar to gnocchetti only narrower and it is generally flavored with saffron. Cook for 10 to 12 minutes. Flat, roughly cut pasta pieces cut from the scraps. 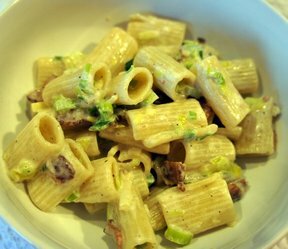 Maltagliati is also the name given to a thick short pasta tube with diagonally cut ends. Cook for 5 to 7 minutes. Short lengths of medium wide (approximately ¼ inch) twisted egg noodles. Egg noodles are also available in wide and extra wide widths. Cook for 6 to 8 minutes. 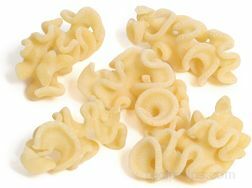 A pasta product that consists of a group of different pasta shapes. The shapes can include small tubes of different sizes, short strands and miscellaneous shapes. Cook for 9 to 11 minutes. This unique shaped pasta is formed into a spiral that looks like a short, thick vine wrapped securely around a very sturdy stem. The outer texture is rough, so that not only the shape but also the outer surface of the pasta retains all types of sauces well. Cook for 8 to 12 minutes. Thick disk shaped pasta that is formed into bowls or "little ears." The outer edge is thicker than the center. Cook for 9 to 12 minutes. A hollow curved pasta that resembles a snail shell. It has a wide opening at one end and at the other end the opening is flattened so that it is almost closed. This pasta is similar to lumache, but it is smaller in size. Cook for 9 to 11 minutes. A smaller version of pipe pasta. Pipette is approximately 5/8 inch long. Cook for 8 to 10 minutes. Pizzichi means "pinched pasta." This pasta is a short diagonally cut pasta with rippled edges. It is approximately 1 3/4 inches long and 3/4 inch wide. Made from farro flour, it is brown in color and has a nutty flavor. Farro is an unhybridized form of wheat that has a type of gluten that is easier to digest than the gluten in durum wheat pasta. Farro is rich in vitamins, minerals and oils, which provide fiber. Pasta made from farro is more fragile than pasta made from durum wheat, requiring that it be handled differently when cooked. Cooked in 4 quarts of water per pound as other pasta but do not stirred during the first 5 minutes of cooking. Cook for 6 to 8 minutes. A thick square shaped pasta that has several lines of rippled pasta running down its length. Cook for 15 to 18 minutes. 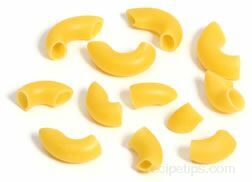 Short chunky pieces of pasta with ridges circling the pasta, which form a shape that resembles the grill of a radiator. Cook for 10 to 13 minutes. A variety of fresh egg pasta that is very similar in shape to fusilloni, rotini spiral, and rotelle pasta. The Riccioli Pasta is formed into many layers of ridges, spaced closely together that spiral upward. Because of its unique shape, it is good pasta for holding a variety of different pasta sauces. Cook for 4 to 5 minutes. Wide, 2 inch long pasta noodles that have a slight twist to them. Cook for 8 to 11 minutes. A flat ¾ inch wide pasta that has rippled edges on both sides. The ends of this pasta have been cut diagonally instead of straight across, adding an interesting look to the pasta. Rombi is similar to the short cut ribbon pasta mafalde except for the straight cut ends on the mafalde. Cook for 7 to 9 minutes. A wheel shaped pasta that is also known as ruote. 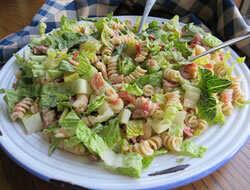 Rotelle is also used as the name of a twisted spiral pasta, which is similar to rotini, only rotelle is larger in size. Cook for 9 to 12 minutes. Twisted pasta that is similar to rotini, only larger in diameter. Cook for 10 to 12 minutes. Short pasta twisted into a spiral shape. Pasta shaped like six spoke cartwheels. Cook for 9 to 12 minutes. Strands of pasta that are coiled into a shape resembling a spring. Similar to fusilli bucati, only spiralini is shorter and coiled closer together. Cook for 9 to 12 minutes. Pieces of pasta that have been rolled across its width, with each side rolled in the opposite direction. The rolled length is then slightly twisted to resemble a twisted, rolled towel. This pasta is very similar to casarecci and umbricelli only shorter in length. Strozzapreti is approximately 1 1/4 inches in length. Cook for 10 to 12 minutes. A torch shaped pasta, which works well to scoop up the ingredients of a chunky sauce. Troffiette A smaller variety of trofie. Cook for 9 to 12 minutes. 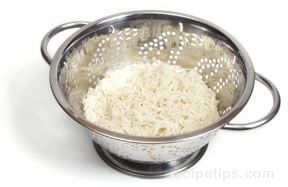 Pieces of pasta that have been rolled on a flat surface until it forms a rounded length of pasta that has tapered ends. It is then twisted into its final shape. A thin stick can also be used to wrap the pasta length around to assist in forming the twisted shape. Cook for 11 to 13 minutes. Short lengths of pasta that have been rolled across its width, with each side rolled in the opposite direction. The rolled length is then slightly twisted. This pasta is in the shape of a "S" when viewed from the end. It is similar to strozzapreti and casarecci only different in length. Umbricelli is approximately 1 3/4 inches long. Umbricelli is also the name given to a pasta that is a long strand pasta that is slightly thicker than spaghetti. Cook for 10 to 12 minutes. Short lengths of wide (approximately 3/8 inch) twisted egg noodles. Egg noodles are also available in medium and extra wide widths. Cook for 6 to 8 minutes.